This race has been going for 44 years and was originally set up as an army training exercise and then taken over in the 1990s by the Gorphwysfa Club. It’s 20 miles, from the north coast to the top of Snowdon, but taking in other 1000m peaks on the Carneddau and the Glyders en route. There are a few shorter variants – I’m talking about the A class here. 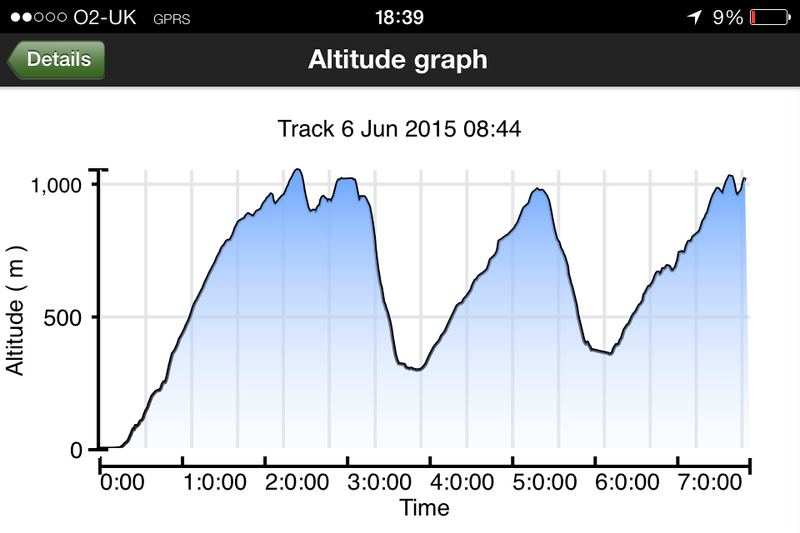 I’ve never done a race that finishes on the top of a mountain (a novel altitude profile! ), so this had to be ‘budgeted’ for by taking an extra layer and a £10 note for the café. Four of us from DVO did the race: Paul, Dave (the fast ones) and Roger and myself who ran together. After an extremely windy night in the tent we had a quick breakfast and got to Llanberis for Registration and the bus to the Start at 8am. I was shivering in the Start field, so it was good to get running up the lovely forested valley leading up to the first checkpoint on the shoulder of Carnedd Uchaf. Very soon it was cags-on again as we climbed up through the bilberries to the ridge. It was eye-wateringly cold up there, so gloves and buff were soon added! At least visibility was good. We’d not managed a reccying trip and I don’t think I’d have completed in the 8-hour cut-off with any navigational shilly-shallying. The next two checkpoints were Carnedd Llewelyn and Carnedd Dafydd, with great views out to Anglesey and worry-inducing views over to the Glyders. Soon we dropped out of the wind and began a nice grassy descent to the Ogwen Valley, where a checkpoint awaited with drink and food. We got there 30 mins inside the cut-off time of 1pm, having done over half the mileage of the race but less than half the climb. Still reassuring though! There was a mile road-run west up the A5 to the car park by Llyn Ogwen where we turned off up the Glyders. The route was up the Gribin ridge, one across from the majestic Tryfan. It was a rocky scramble in places, so that took your mind off how tired you were! The third 1000 metre peak, Glyder Fawr, had some Tolkeinesque rock formations which looked quite atmospheric in the mist. Then there was a nice descent to the welcome sight of Pen-Y-Pass where Andy was waiting with our bags – the crisps and Red Bull went down very well! We left at 2:50pm so had 2 hours 10 to get to the top of Snowdon via the Pyg track and Carnedd Ugain before the 5 o’clock cut-off time. Well, the world and his wife seemed to be climbing Snowdon, and none of them adequately dressed! I deflected a couple of 20-somethings in jeans from going over Crib Goch and Roger donated his gloves to a young lady sat by the path, disconsolately staring at her hands. It was good to see Paul then Dave coming down and get some words of encouragement. Where the path zig-zags up the corrie wall I went ahead as I was getting cold, but from there it was incredibly quick to turn right on the ridge to get Ugain and then backtrack to the col and follow the railway and throngs of tourists to Snowdon proper. Much relieved, I put on my spare fleece and waterproof trousers over my shorts, visited the summit cairn and then Roger arrived 15 mins inside the cut-off! The cafe was closed – it had been too windy for the train to run, so I guess the staff couldn’t do their commute. So no pie, chips and coffee, but it was nice to walk down and appreciate the scenery at leisure. We forked onto the longer Miners’ Track to drop out of the wind and avoid down-scrambling the bits on the Pyg Track that we’d up-scrambled – always easier! And in a semi-euphoric state got to Pen-Y-Pass and the comfort of Andy’s car at 6:30pm. A great day out with the perfect amount of challenge! Thanks to the huge team of helpers who braved that wind for hours, to Andy for original inspiration and graciously doing road support due to injury, and the others for banter – a great weekend! I’m so impressed, with your stamina, determination and grit! I enjoyed reading about your journey to the summit and the route you took, especially the detail where you found the best views. It sounds like you were those youths heroine, it,s a very spectacular view from Crib Goch but a bit scary! You all definitely deserve a medal for managing that part of the race! Seattle to Boston - this time, it's personal. follow our adventures in ultrarunning!